M: I hate to interrupt your conversation, but we’re out of eggs. J: I’ll go pick some up. Be right back. 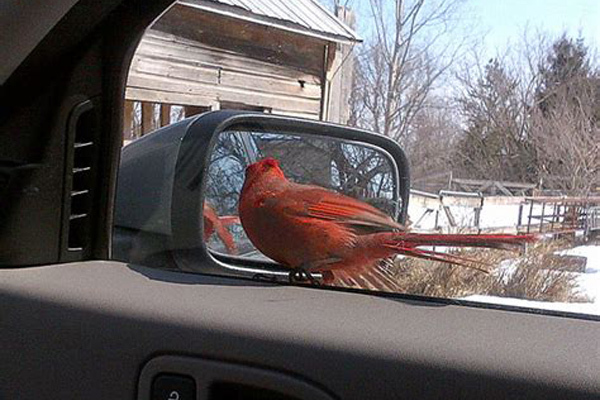 That cardinal is pecking the side mirror of the truck. M: Uh-oh! What have we gotten ourselves into! L: He’s mistaking his reflection for a male rival! I need a picture of that! M: Don’t go near that bird, young man! L: But, Mom! It’s part of my science project! I need a picture of that! ★ There’s a long brown snake! ☆ Don’t go near it! ★ I need a picture of that for my blog! Don’t go near that bird, young man!